You want your content to be fresh – not old, stagnant, and irrelevant. Google wants the same thing. Your users want the same thing. 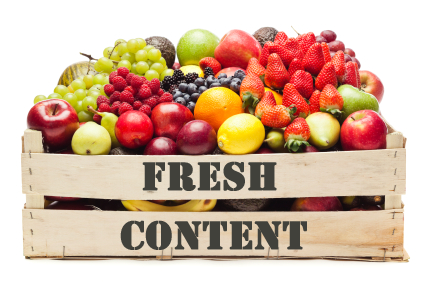 Have you ever thought about a freshness index and what that means to your content creation process? If you produce content that is fresh, vital, relevant, and interesting – Google will like your site better. Your visitors will like your site better, too – because an audience craves fresh information. Being the first to publish content about a topic can look really good for your site, and Google’s algorithms will pick up on that. Google likes to see fresh content, and they want to see that you’re covering what’s interesting, important, and relevant. Why is that? Well, their users like content that has those qualities. You have to be publishing content that is interesting, and you have to keep producing content, not relying on old content to carry you forward. What Is Google’s Freshness Update? Back in 2003, Google filed a patent for a search algorithm that would score content based on how fresh it was. It was a patent that would change the search world forever. One industry expert referred to it as one of the top ten search patents of all time. It was a patent that was responsible for several additional patents, mostly improvements on the initial one. One of these recent updates to the initial patent concept was Google’s Freshness Update. The idea was that it would put a greater emphasis on returning fresher content, at least for certain search queries – not all would apply equally. It’s common sense what kind of content needs to be fresh. It’s not terrifically hard to figure out. Some content, of course, will do just fine in the rankings even if it’s incredibly old – because some facts never change, and some information is evergreen. How Does Google Measure Freshness? There are a number of factors that come into play when Google is analyzing freshness. The document’s inception, document changes, rate of document changes, new pages added to the site as a whole, rate of new link growth, how many links from fresh sites you have, and user behavior are just some of the factors. It’s important to note that there are no hard-and-fast rules on what makes a site fresh. Much of this is theory, and Google doesn’t explicitly say exactly what fresh content is. However, these factors should be enough to go by. Theoretical analysis of the patents aside, it’s common sense what you need to do have fresh content. If you’re in a niche that requires fresh content, you can’t rest on your laurels and just hope for the best with old content. Sometimes, older content will rank better than newer content. Consider a search for an old document like the “Declaration of Independence”. In that case, having an older, more authoritative site could actually help you. If you’re not willing to put in the work to update your content regularly, then you may want to reconsider what area your website focuses on – and stick with content that is evergreen. Don’t forget to grab yourself a copy of SEOPressor too, I’m pretty sure you will find SEOPressor’s Smart Linking feature to be very helpful in managing your link building campaign.